Posted by Madeline Patton on November 5th, 2018 at 11:00am . As part of its effort to bring more people who are deaf and hard of hearing into the STEM workforce, DeafTEC’s Project Good to Go works with California community colleges to provide resources for faculty who teach large numbers of military veterans. “Hearing problems—including tinnitus, which is a ringing, buzzing, or other type of noise that originates in the head—are by far the most prevalent service-connected [disabilities] among American veterans,” according to the Office of Research and Development of the U.S. Department of Veterans Affairs (VA). The list of Top Ten Things Student Veterans Would like Faculty to Know was developed by DeafTEC, the Technological Education Center for Deaf and Hard-of-Hearing Students at the Rochester Institute of Technology in New York, to raise educators’ awareness of the challenges student veterans face on college campuses and to share universal design for instruction practices that benefit veterans and other students. Posted by Jessica Behrman on October 17th, 2018 at 8:54am . From October 24-26 the American Association of Community Colleges (AACC), with support from NSF, will hold the 25th National ATE Principal Investigators’ Conference at the Omni Shoreham Hotel in Washington, DC. The annual conference offers a chance to share, collaborate, learn, and meet with other innovative members of the ATE community, including PIs, select project and center staff, and NSF program officers. ATE Central is particularly excited about this year’s meeting; after all, ATE only turns 25 once! 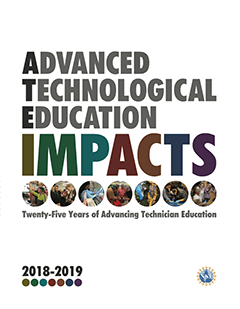 ATE Impacts 2018-2019: 25 Years of Advancing Technician Education. This year the new ATE Impacts book launch was received by the community with an exorbitant amount of enthusiasm. Whether you received free copies of the book to promote your project or center’s efforts and need more, or you never got around to ordering some but would like to push them out on your campus or to industry partners now, please don’t hesitate to get in touch with us. Visit the order form on the ATE Central site to place your order, or stop by booth #002 to pick up extras at the PI Meeting. Posted by Madeline Patton on October 1st, 2018 at 7:00am . As the Advanced Technological Education program marks 25 years of existence within the National Science Foundation, three community college educators who were among the first cohort of ATE principal investigators (PIs) were asked to reflect on the program’s evolution and their experiences as STEM leaders. The principal investigators also encourage two-year college faculty members to consider how their ideas for improving STEM technician education align with their institutions’ strategic goals, and then explore the ATE program solicitation (http://nsf.gov/ate) to see if their ideas meet the criteria for ATE funding. There is not much time before this year’s October 15 deadline for proposals. But it is never too early to begin preparing a proposal for next year. ATE proposals are next due October 3, 2019 and October 1, 2020. Posted by Kendra Bouda on September 17th, 2018 at 10:00am . With the increasing demand for knowledgeable, skilled cybersecurity technicians in the United States workforce, ATE projects and centers are creating materials that discuss and explore the ways in which educational programs can meet this need. What some may not realize, however, is the variety of industries in which a cybersecurity technician’s skills can be put to use. In this month’s From the Archive blog post, we’re highlighting the work of three ATE projects and centers that have supported the education of technicians working in various sectors of the cybersecurity industry. Resources featured include a series of presentations focused on the topic of autonomous vehicles, with an emphasis on the cybersecurity and ethical concerns surrounding this technology; a community college course for students who are preparing to enter the information technology field of healthcare; and a report that details the results of an effort to map cybersecurity curricula to the National Cybersecurity Workforce Framework 1.0 Knowledge, Skills, and Abilities (KSAs). For more information about these specific resources, explore the links provided below. Posted by Madeline Patton on September 4th, 2018 at 11:00am . Andrew Kott is the “perfect technician” to teach rural high school students about automated warehouses and supply chain technologies, according to Shamus Funk. As principal investigator of the Smart Manufacturing and Resources for Transforming the Future (SMART Future) project, Funk hired Kott to teach students and to work with high school teachers in Chippewa Valley Technical College’s Mobile Manufacturing Lab. “Students respond well to him,” Funk said, citing Kott’s youth, energy, and knowledge. Kott worked in industry after earning a two-year machine tooling diploma at Chippewa Valley Technical College in 2012. He’s currently taking courses to earn a bachelor’s degree in education. Laughing modestly about the compliment, Kott said, “I enjoy what I’m doing; I’m enjoying sharing this information with the students and seeing them grow.” He credits the students’ engagement to the mobile lab’s “cool equipment.” For the SMART Future project the lab has been equipped with robotic industrial arms, a CNC vertical mill, a laser engraver, laptop computers, and a small-scale simulation of an automated distribution center. The project’s goals for the high school students include having them demonstrate mastery in automation, networking, programming, and supply chain technologies to qualify for industry certifications and/or college credits. The project’s other ambitious goals include devising a sustainable system to gauge its impact on students’ career paths. Posted by Jessica Behrman on August 20th, 2018 at 9:50am . This May, 713 presenters and co-presenters shared their videos that showed projects that are centered around STEM education. The showcase, which was funded by NSF and encompassed 214 video presentations, explored a plethora of diverse fields that involve teaching, research, and career pathways in STEM. Many of the submitted videos focused on integrating STEM into young children’s lives and education. One such video, “STEM in the Playscape: Building Knowledge for Educational Practice,” submitted by a team of researchers from the University of Cincinnati, explores STEM concepts in relation to nature-based play in early childhood settings. The presentation shares how much of an impact a “playscape” can have on the burgeoning mind of a child, and how exploring the “science of living things,” can impact concepts such as inquiry skills and spatial cognition in children. “S-POWER Engineering Pathways for Transfer Students,” submitted by Claire Duggan of Northeastern University and Massachusetts Community College, explores the impact of a grant from NSF for transfer students from under-represented groups who are studying energy. S-POWER (Student Pathways Opening World Energy Resources) seeks to address two primary concerns: low persistence rates of under-represented transfer students in STEM-based programs and the need to train a new generation of students to work in STEM-based disciplines. The ATE community was represented in this video showcase. One such video, “A Peek at iCREAT Project’s Multi-Disciplinary Courses,” by PI Shamsi Moussaka and Co-PIs Giuseppe Sena, Susanne Steiger-Escobar, and Marina Bogrod at Massachusetts Bay Community College, looks at how classes on STEM topics such as coding and robotics can impact students from underrepresented groups. The STEM For All Video Showcase is a great resource for ATE projects and centers in terms of the diverse settings in which STEM-based principles and theories can be applied. This showcase, which is an annual event, provides a great example of how STEM concepts can be integrated into a multitude of settings and is an inspiration for teachers, researchers, and students alike. Visit the video hall to view the full archive of the 2018 showcase. Posted by Madeline Patton on August 6th, 2018 at 3:59am . The high percentage of students who succeeded in the contextualized remedial math course that the Regional Center for Nuclear Education and Training (RCNET) created for students in the electric power technology program at Indian River State College (IRSC) has led college leaders to broaden its reconfiguration of college-level algebra. This fall 150 engineering technology students—most of them new to the program at the Fort Pierce, Florida, community college—will take the redesigned math course that teaches trigonometry, statistics, and algebra in the context of STEM technician careers. The new course replaces the college-level algebra course that has historically stymied students, particularly African-American males. “This is one of the few things that has moved the needle,” said Kevin Cooper, referring to the increase in enrollment and persistence of minority students in the electric power technology program at IRSC. Cooper is principal investigator of RCNET and assistant dean of Advanced Technology at IRSC. Before a highly engaged audience of 50 educators, Cooper talked about how to eliminate math as a barrier to entry and success in technical fields on July 25 at the High Impact Technology Exchange Conference (HI-TEC) in Miami, Florida. From the Archive: Workforce Education at our Community Colleges: What Works? Posted by Kendra Bouda on July 23rd, 2018 at 10:00am . In addition to the STEM curriculum and professional development materials that ATE grantees create in large volume, some members of the community also conduct research, compile reports, and share their findings with the broader STEM community. In this month’s From the Archive blog post, we highlight the work of three ATE projects and centers that have produced insightful publications that address such areas as program evaluation, educational reform, and recruitment and retention of minority students. These resources represent only a few of the assorted research reports, articles, and best practice guides created by ATE grantees; for more reports, check out the links below or try browsing our reference materials by resource type. Posted by Madeline Patton on July 9th, 2018 at 11:00am . This month ATE Impacts 2018-2019: 25 Years of Advancing Technician Education rolls off the presses for mass distribution to centers and projects around the nation, and to attendees of the High Impact Technology Exchange Conference (HI-TEC) that begins July 25 in Miami. The book showcases the work of the National Science Foundation’s Advanced Technological Education community and celebrates the 25th anniversary of the program. In addition to the summaries of ATE projects’ and centers’ activities and outcomes, the new book has an article that offers a snapshot of the ATE program’s influence on students’ careers. The article features Karen Wosczyna-Birch, principal investigator and executive director of the ATE-funded Regional Center for Next Generation Manufacturing (RCNGM), discovering how the first ATE project grant she received nearly 20 years ago influenced the career of Hilda Arguelles, one of her students. The two women reconnected at the 2018 Connecticut Technology Council Women of Innovation® Awards ceremony. Both women had been nominated as statewide innovators. Posted by Jessica Behrman on June 18th, 2018 at 8:00am . This new report from the Brookings Institute outlines effective and non-effective learning strategies in educational settings from kindergarten through college. From data gathered by a study conducted by the Knowledge Matters Campaign, it’s deduced that interactive, hands-on learning, regardless of the educational material or concept, is a much more effective learning strategy than traditional, passive instruction. Professor Noah Finklestein, of the Physics Department at the University of Colorado, conducted research on learning attitudes and student beliefs and structures his classroom around those findings. This research suggests that college students usually learn less than 25 percent of basic concepts that they did not already know in introductory physics courses. Furthermore, the students do not see the relevance of the content to their lives. Finkelstein coordinates classroom material to be in an “interactive-engagement” style of learning, where students work in small groups and apply the content in computer simulations and hands-on activities. The data show that student-learning outcomes of the most seasoned lecturers are equal to the lowest performing interactive-engagement classrooms, and when done well, the interactive-engagement format vastly outperforms the top lecturers with students learning more than double the physics content. The report compares this research with early childhood education methods. Researchers Molly Welsh Chilston and Linnea C. Ehri published their findings on research done on vocabulary learning with third graders. They taught third graders six unfamiliar verbs presented in either a coherent context—like a birthday party—or as a set of matched but unconnected contexts. Children learned more of the words when they were nested within a theme than when they were more independent. This hard evidence suggests that using a hands-on, interactive approach to learning greatly enhances the probability of actually remembering what you’re learning. ATE projects and centers may find this report of use when considering classroom activities or how to incorporate an interactive-engagement lesson into a curriculum. Please visit the Brookings Institute to view the report in full.